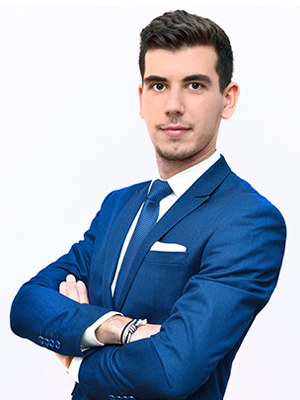 Cristian Tănasă graduated from the Faculty of Law in 2016 and has been a member of the Bucharest Bar since 2016. In his time as a student, Cristian has participated in numerous moot court competitions, exempli gratia the ”Francisc Deak” National Moot Court Competition on Civil Law, where he was awarded the Best Speaker distinction. As an undergraduate, he obtained several scholarships and wrote a few articles on transport law, civil law and intellectual property. Also, he spent some time as a trainee, during which he was involved in various civil and commercial law projects. As a postgraduate, Cristian continued to improve his writing abilities in the field of private law and made a tremendous research effort, culminated so far with the publication of two books and numerous articles in the most renowned romanian legal journals. – representing several famous romanian artists in IP-related rights disputes against collective management bodies of IP rights.